Sorry, but the size/color option selected is not available. Sizing can vary between different brands. If you are not familiar with a the brand you wish to order, please match your measurements (in inches) to the size guide below. If you would like more information on how a particular brand fits, please call customer service toll-free at 1-888-855-9292. Fit: Most of our items are made with a generous fit allowing for more comfort. Some of our items are a modern fit, a bit more tapered and shaped, more accommodating to a slimmer build. Our modern fitting items will have a MF icon shown next to them. Ties: Our Ties are approximately 56 inches in length. Belts: We recommend that you order the next even size up from your waist size. Neck: Measure around the middle of your neck at your Adam's apple. Allow room for your index finger to fit between the tape and your neck for a comfortable fit. Chest: With your arms at your side measure around your upper body. Measure under your armpits and over the fullest part of your chest and shoulder blades. Sleeve: Measure from the center of the back of your neck to your wrist. Waist: Measure around your natural waistline at the height you normally wear your pants. Head: Measure around head above brow ridges. Cutter & Buck makes it easy to show your team support, while keeping pace with your active lifestyle. 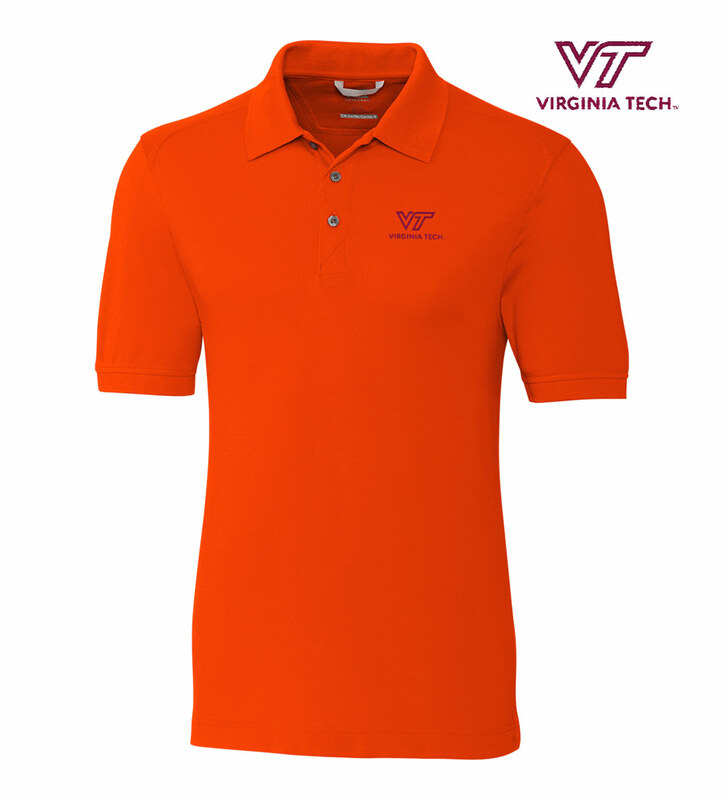 This short-sleeve solid polo shirt features an officially licensed embroidered Virginia Tech logo on the left chest. The DryTec Cotton+ fabrication delivers a soft hand with a touch of stretch, plus moisture management and UPF 35 sun protection. 55% cotton, 42% poly, 3% spandex. Machine wash. Imported. NOTICE: This custom item is made to order and is NOT RETURNABLE. Allow an additional 5-7 days for embroidery. Ships separately. I want to be contacted by customer service.